Our Textilene® 80 Solar Screen Kits are a great low cost way for that do it yourself type of person to build their own screen. We supply everything that any novice DIY needs accept the physical labor to build a nice solar screen. The Twitchell™ Textilene® 80 solar screen material blocks a lot of the sun’s damaging UV rays to protect you furnishings and flooring. It also offers some daytime privacy. The Textilene® Sun Shade material is very strong with over a 400 lb. breaking strength per square inch and it is also fire retardant. Twitchell™ is a world leading manufacturer of solar screening materials. 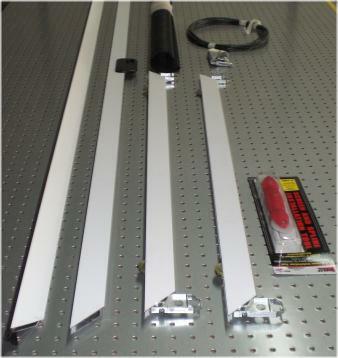 All The Parts Needed To Make One Solar Screen. Textilene® fabric is the choice of solar screen professionals. You cut the frame to your specific size requirements. Custom cuts required and is Non-Refundable. Order a Solar Screen Kit - Textilene® 80% today! Simple to put together and the heat reduction is amazing. Advantages: Finally my front bedrooms are cool. Everything was as advertised and came promptly. Very happy with the product. Purchase a DIY screen kit. Looked so good and was so easy that I bought 3 more to cover all of the windows on the west side of the house. Expect to do more later. Advantages: Looks fabulous. Cannot tell the difference between mine and the professionally installed screens next door. Plus the cost is a fraction. Did 4 windows for what another company quoted for a single window. Disadvantages: MUST keep the corners square while making the screen. Buy some inexpensive corner clamps to hold them square as you make the screen and it will work great! Suited our purposes to reduce heat coming into our breakfast room from the transom window above our single French door leading to our deck. We had experience replacing screening in windows of our previous house and thought we'd try solar screen for our new home. The process was the same but the screen material being thicker than regular screen makes it a bit harder to roll the spline into the groove. My husband had to do that part. I'm happy with the results. Advantages: More color choices than the home improvement stores and we were able to match the gray color of the solar screen retractable screen door we had installed over our deck door. Disadvantages: Takes two people to get the screen into the frame on the square. Great product, friendly staff and great instructions on how to install!!!! Disadvantages: A little tricky to get the measurements right the first time when you have not installed before. The kits I bought are great. Easy to assemble and install. Now I only have 25 more windows to go. Advantages: Keeps out the Texas heat and allows more privacy. Disadvantages: The clips I bought had to be cut off. Need some that are a inch long. I have to surface mount the screens and didn't want to a hole in the vinyl windows. Excellent service as always. I have bought from them before and always got just what I ordered and it is high quality. Screens are on the windows and look great! I ordered the screen kits to save a little money by doing it myself. They turned out great and really were pretty easy to put together. The screens look great on the house and I have had several neighbors and co-workers ask me about them. Advantages: The extra privacy and cooler home. Yes they do make a difference. I actually bought the Suntex 70%. Advantages: Very easy to work with and excellent visibility. I am happy to trade off 10% for the ease of installation and better air flow. The Screens are very nicely made. However, I made a slight mistake when I ordered them so unfortunately I am unable to use them. I will order new screens again when I can come up with the money as these are a little pricey.